This was caused by the Azure IoT suite remote monitoring sample, which eats up your credits very fast when you leave it running. Now wouldn’t it be nice if there were some way to get alerted when your credits begin running low, before you run out completely? Well turns out Azure has such a feature in preview. 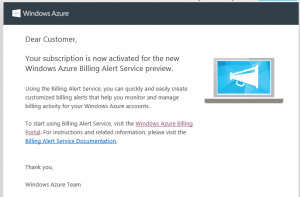 It’s called “billing alert service” and you can find instructions on how to activate it here. Note: I received the confirmation e-mail quite fast, but had to wait longer before the option actually started working in the portal. It took a couple of days before the “ALERTS” option appeared, so be patient. Great feature for folks like me who regularly try out all kinds of features and might not keep daily track of how much credits they’re spending! One option I am missing though is to set an alert based on your spending cap. For instance, I currently have a spending cap of 130 euro’s and would like an alert as soon as 75% of those credits have been used. Of course I can set an alert on 97.50 instead, but in my opinion it would be cleaner if you could also enter a percentage. When you agree, you can vote on this feature requests here: https://feedback.azure.com/forums/34192–general-feedback/suggestions/11586345-set-billing-alerts-based-on-spending-cap.